Castleford Tigers head coach Daryl Powell is expecting a response from his players after the defeat to St Helens. After their previous loss this year, the Tigers bounced straight back and ran up four straight victories and the Tigers boss is hoping for something similar again as his team looks to hold onto top spot in the Betfred Super League away at Hull this Sunday. Powell said: “I’m confident we can put the St Helens game behind us, focus on what’s in front of us and get the job done. “It will be tough, but we’ve got the team and the players capable of doing it. We don’t fear anyone, it’s just us being on our game to give ourselves a chance. “We did well to respond after the Salford game. We’ve won four, lost one then won four, lost one so hopefully we can get back on track straight away. “It’s going to be very difficult again this week at Hull, that’s the competition, and it’s always tough after Easter. 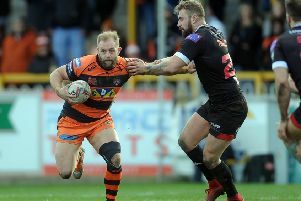 They got back on track against Leigh after a couple of tough losses at home. Unlike with the trip to St Helens where they have not won for 25 years, Cas have a good recent record against Hull, but that will count for nothing according to Powell. On Hull’s season so far, Powell added: “They conceded a lot of points in the two games before they played Leigh, but I think they’re getting some players back. Danny Houghton’s been missing and he’s a significant player for them. “They will have been disappointed, but that doesn’t matter really, it’s about what you do in this game. “We’ve been playing really well until we got beat by St Helens so it’s important you’re there every week. You don’t worry about what teams are like before you play them or after, it’s what you are like when you’re on the field in that game that’s important. “They are a good side and did really well last year. They started this season off in outstanding form then got a couple of injuries.